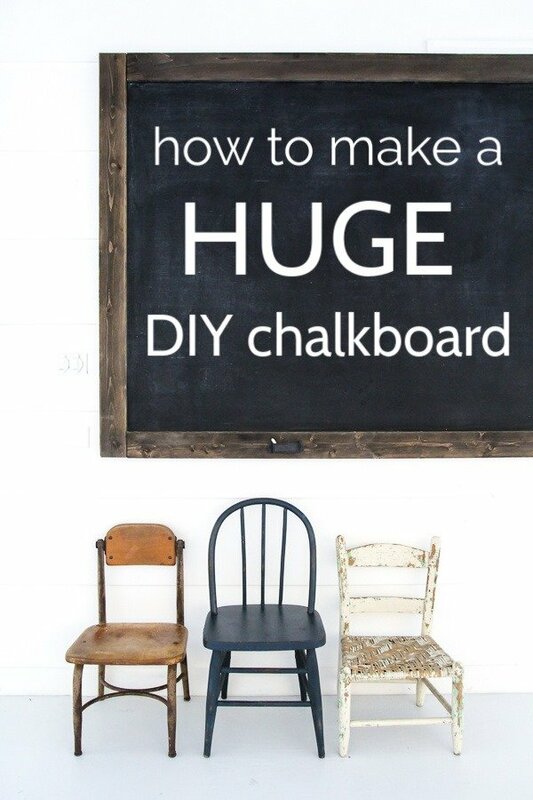 How to Make a Huge Chalkboard for Cheap - Lovely Etc. This large framed DIY chalkboard is easy to make yourself even if you are a beginner DIYer and even better, it’s crazy cheap. One of my favorite parts of our $100 basement home gym is the giant chalkboard I made for the space. It adds a ton of style and it has also been the perfect spot to keep track of workouts and fitness goals. 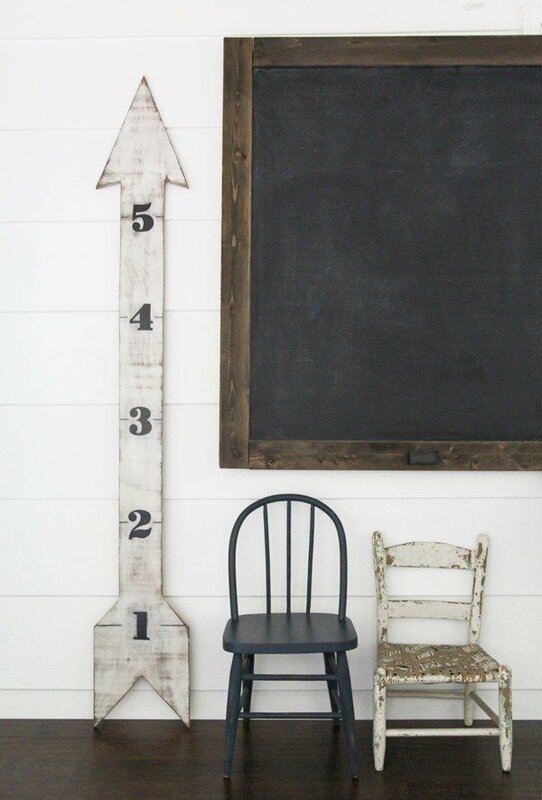 And even though our giant chalkboard lives in our gym, I think it would also look amazing in so many other types of spaces – a homeschool room, an office, a playroom, even a farmhouse style family room or dining room. Use it to display a giant menu plan or one of your favorite quotes or your plans for the week. Or just let your kids go to town adding their own sweet art. I have been meaning to share this huge chalkboard tutorial for awhile now and after a few readers recently asked about it, I’m finally getting it done. I even got myself in gear and hauled it upstairs so I could get some decent non-basementy pictures. 1. It is seriously easy to make. You need to cut a couple of boards and drill some holes and that’s pretty much it. This is a perfect DIY project even for a beginner. 2. It is seriously cheap. Like crazy cheap. I already had some chalkboard paint on hand from another project and the wood for this huge chalkboard cost less than $25. For a chalkboard that is eight feet long! That is a killer deal. The final chalkboard is 51” high and 100” wide, or slightly bigger than 4’ x 8’. If you would like to make a smaller chalkboard, you can adjust your wood cuts to whatever size you need. 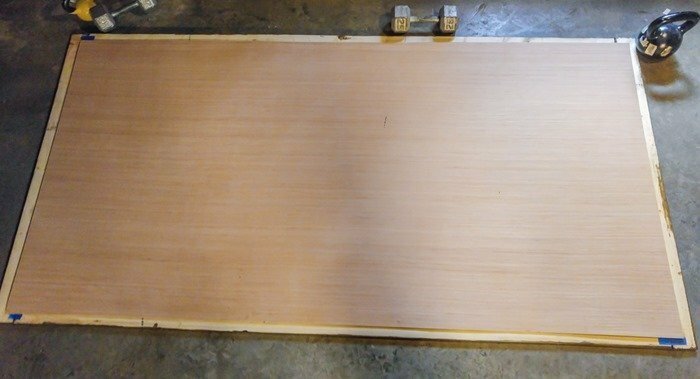 The first step is to cut the wood strips for your chalkboard frame. Furring strips are the perfect wood planks for this type of frame. They are very inexpensive and have a rough texture that gives a great rustic feel when stained. Any big box store that carries lumber will also have furring strips. Cut two of the furring strips to 93” long and two of the furring strips to 51” long. If you don’t have a power saw at home or want to save a little time, you can have these cut at the store when you buy them. If your furring strips have any splintery areas, you may want to sand these off. Otherwise, you can skip sanding altogether. 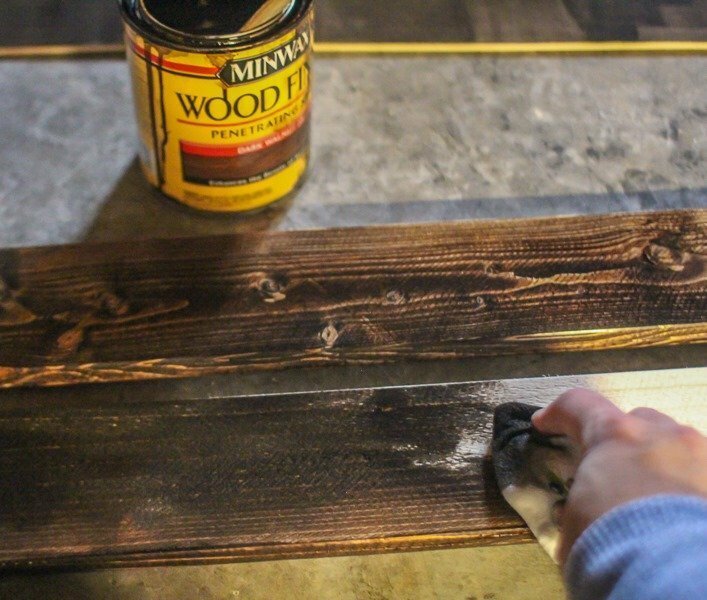 Use a clean rag to stain the frame pieces with Minwax Dark Walnut stain. Simply wipe the stain on with a clean rage and then wipe off any excess after a few minutes. Be sure to stain the sides of each board as well as the front. 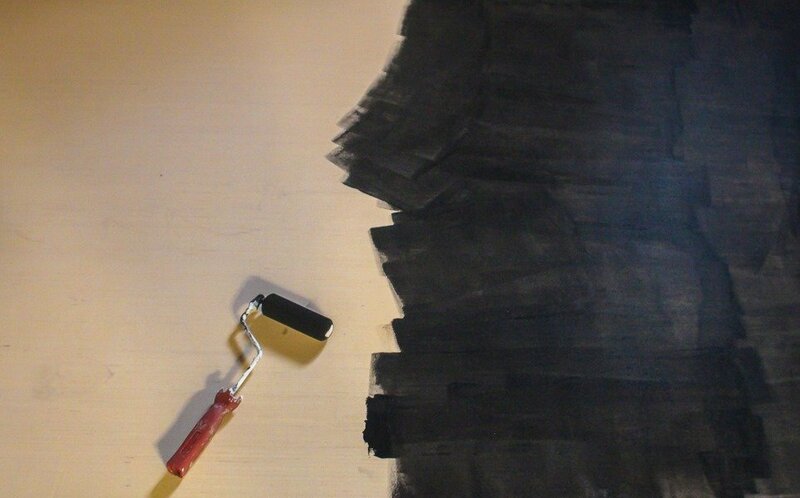 While the stain is drying, you can create a chalkboard from your plywood. I used RevolutionPly from Lowes for this project and it came with one side already pre-primed. 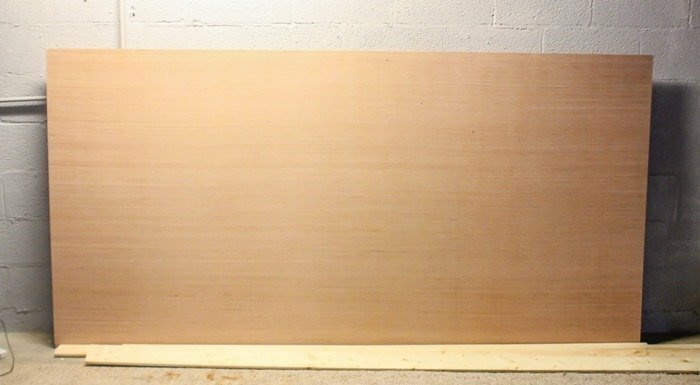 If you are using plywood that doesn’t have any primer on it already, it is a good idea to add a coat of latex primer before painting on your chalkboard paint. Then simply use a foam roller to paint one side with chalkboard paint. You will probably need a couple of coats of paint to get good coverage. 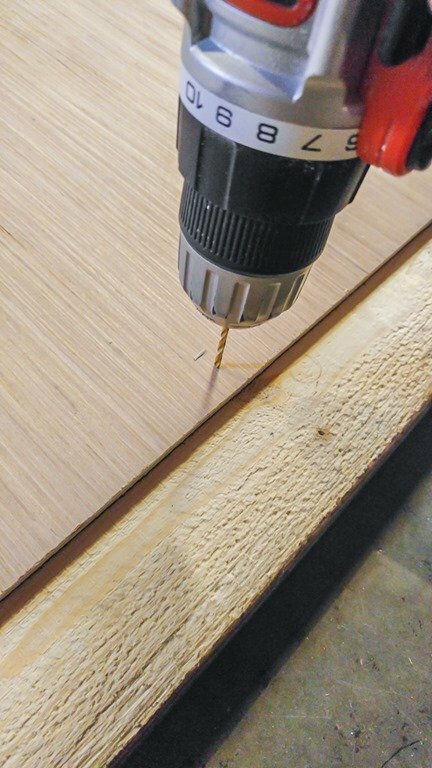 To build the frame, lay the boards that you previously cut and stained face-down on the floor. Use wood glue to attach the sides to the top and bottom pieces and then use painters tape to hold it in place while the glue dries. Next lay the chalkboard face-down centered on the frame. The frame should extend slightly beyond the chalkboard on each side. We are using wood screws to firmly attach the chalkboard to the frame. Drill 4-5 pilot holes on each side of the chalkboard. These holes should be around an inch from the edge of the chalkboard; you want to make sure to drill through the chalkboard into the frame. Then use a wood screw in each hole to secure the chalkboard to the frame. 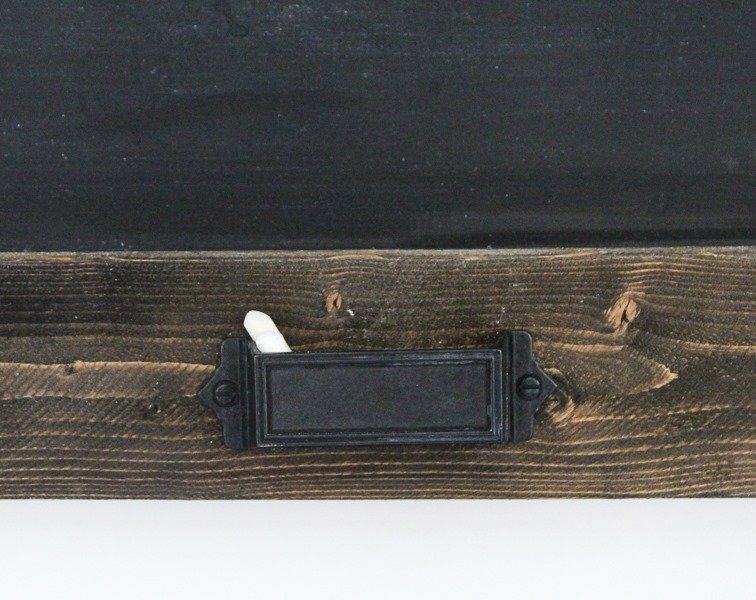 My favorite detail of this huge chalkboard is the cute chalk holders along the bottom. They just give it that extra something. These little chalk holders are actually just drawer pulls attached upside down. I used these rectangular pulls, but any bin pulls will work. Simply use screws to attach them to the bottom of the chalkboard frame. Before writing on your chalkboard, be sure to prime it with chalk. Generally, you are supposed to allow the paint to dry for 24 hours and then rub a piece of chalk all over the chalkboard, but be sure to check the instructions on your specific brand of chalkboard paint. Now your chalkboard is ready to hang! Luckily, it isn’t very heavy considering how large it is. You can use a pair of picture hangers and sturdy picture hanging wire to hang it. Or if you prefer, you can make it extra secure by using one of these heavy duty hanging cleats. 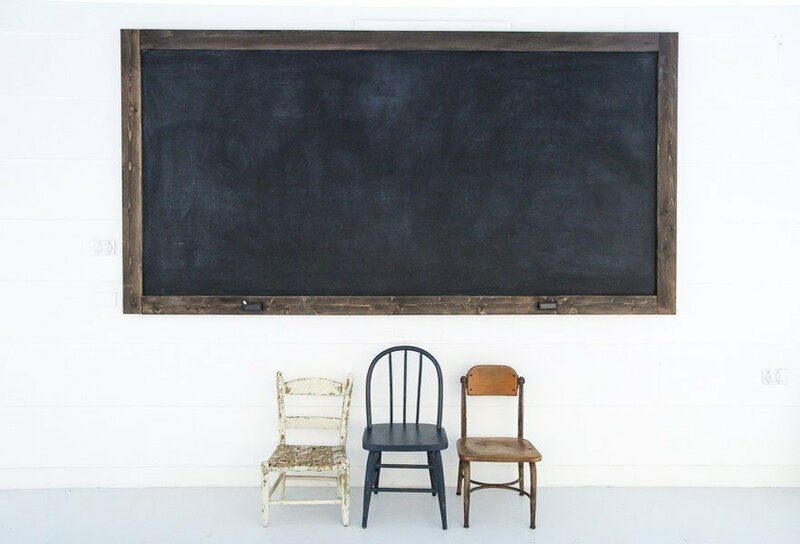 Isn’t it the perfect chalkboard for a big blank wall? I think it adds just the perfect amount of farmhouse/industrial style.